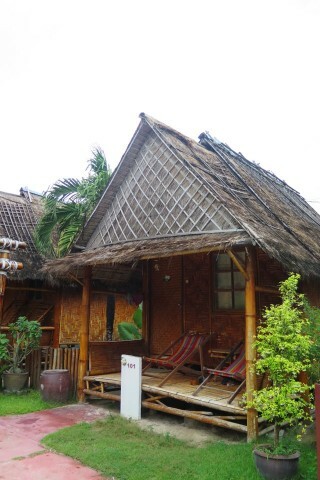 The main offering at PP Twin Palm Bungalows is very basic wood and thatch bungalows, all with room for a bed, a fan, and that’s it. Average rating 6 from 409 reviews. Some have been upgraded with air-con. These are not spacious beach shacks; if you share one with a partner, you’d better like each other a hell of a lot. Notwithstanding, this may be just what you’re looking for in a cheap, almost-right-on-the-beach bungalow on Phi Phi; a place to conk out after finishing up a day of sunbathing and having your fill at one of the beachside bars. The drawback of the Twin Palms is the loud no, deafening, music that fills the air until late at night (or early morning; maybe 05:00 in the high season), so don’t count on getting to bed early. Popular with young traveller folk who want to leave the world behind, but with a large group of those similarly inclined and to a throbbing dance-music sound track. Stay here only if you love the proximity to the beach and the Ibiza beach party scene.